The Chukchis appeared in the tundra before the Christian era and called themselves the “Luoraveti” or real people. The ‘Chukchis’, or descendants of primitive deer herders and sea hunters still live around Chukotka in the far north of Russia, the region with the country’s severest natural conditions. From Moscow to reach Anadyr, the administrative centre of Chukotka, you need to fly over six thousand kilometres due east. The temperature in Anadyr, in the heart of the permafrost and icy winds blowing from the Arctic Ocean and the Barents Sea, reaches -50 degrees Celsius in the winter. Anadyr, the biggest town in Chukotka (50,000 residents out of whom 15,000 are Chukchi), has a population of 16,000, the largest in the region. The town resembles a box with multi-colored candy when viewed from the sky, since the houses are painted in vivid colors. The town has a school, a hospital, a port and a library. This is the most developed place in Chukotka. The conditions are much worse in the other settlements; you can get from one place to another only with ATVs and reindeer. 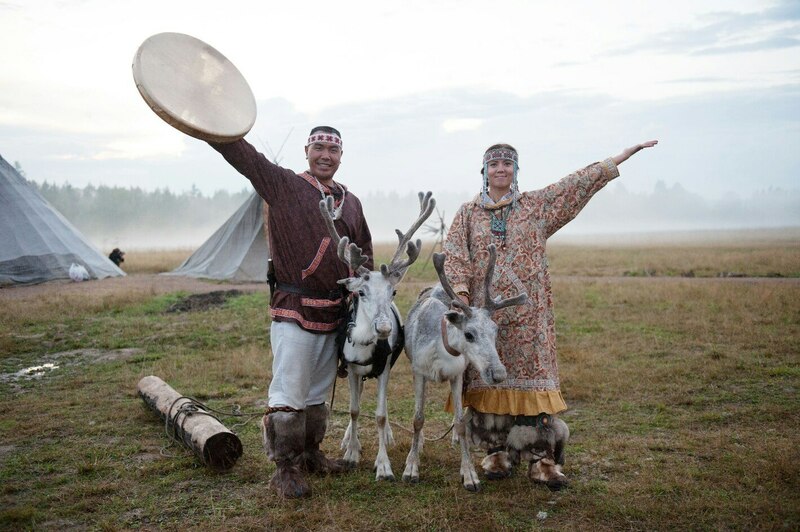 The Chukchis appeared in the tundra before the Christian era and called themselves the “Luoraveti” or real people. These people then wandered across the peninsula with thousands of deer, they hunted whales and lived in ‘yarangas’, the original transportable tents made of deer hide. Traditional life for the Chukchis was so difficult that death was not perceived as a tragedy. Famous Russian ethnographer Vladimir Bogoraz wrote of the "voluntary death" phenomenon among the Chukchis, when the elderly either killed themselves or asked their friends or relatives to do it: "The reason for the voluntary death of the elderly is not the lack of kindness on the part their relatives but most likely the difficult conditions." This, however, did not deter the Chukchis from being excellent warriors and becoming the only people of Chukotka (where there are also Evens, Yukaghirs, Kereks and Eskimos) who did not submit themselves to Russian expansion in the 17th century. With the advent of the Soviet Union, which supported small groups of people as policy, life for the Chukchis radically changed. The indigenous population understood the importance of writing and school education and their life significantly progressed while the death rate declined. Unfortunately, after the collapse of the USSR, the region again entered a period of degradation. Deer herding farms and fur production plants closed down since they could not fit into the new capitalist reality, and there was no other work available. Most Chukchis today do not live in ‘yarangas’ but in stationary buildings and work in the services sector. Nevertheless life in Chukotka is still harsh. Goods are expensive and salaries are still low (20,000 rubles - $310), so young people move to other regions in the country. Their trades, deer herding and hunting marine animals, are in decline. In 2015 there were less than 1,000 deer herders left. "Earlier, this trade was a calling card for the region. Problems began in the 1990s. And after the mid 2000s, when billionaire Roman Abramovich was no longer governor of Chukotka, deer herding became a loss-making industry. Since venison costs more than what is brought from continental Russia, it has not developed on the market," said Vladimir Puya, hereditary deer herder and director. Despite their difficult lifestyle, there are those who try to preserve their traditions. Residents of the national Lorino settlement, located on the Barents Sea coast, still hunt whales. Several years ago a documentary film was made about them and received the prestigious Russian TEFI Award. The story of the film is narrated by Evgeny Kaipanau, a 36-year-old Chukchi who grew up in Lorino and now works with the national ensemble in Moscow. He is in constant touch with his relatives who remained in their homeland. "Ever since I was born I have known how to hunt walruses and whales, how to fish and go out into the tundra," Kaipanau says. The performer affirms that there are young people in Chukotka who wish to uphold their traditions. "They learn the Chukchi language, participate in national celebrations and live on whale hunting." What awaits the Chukchis in the near future? Despite financial assistance from the Russian government and certain production companies operating in the region, the socio-economic situation in Chukotka is more difficult than in other Russian regions. More and more Chukchis are forced to move out of their villages and settle in towns to find work and housing, consequently losing their traditional way of life. Because of the harsh climate, poor health system and low social living standards the average life expectancy of the Chukchis is only 45 years. Russian oligarch Roman Abramovich was occupied with the region's affairs for almost 13 years. First he was governor of the Chukotka Autonomous District (2001-2008) and then Chairman of the Chukotka Autonomous District Duma (2008-2013). Residents of Chukotka have only fond memories of their former governor. During his governorship the region's gross domestic product increased five times and the average salary also grew significantly. Abramovich also sometimes used his own funds to give the residents generous gifts in the form of gratuitous double-glazed windows and summer travels.